This past weekend we visited friends to watch a football game. 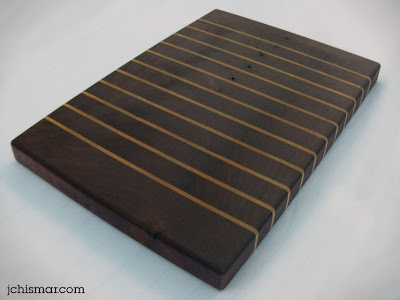 I made this football field cutting board from black walnut and poplar wood for our hosts to commemorate the event. We had fun, food and libations and we can’t wait to do it all over again. Autumn is here and it once again has brought with it the dreaded task of picking up leaves. My town only picks up leaves bagged in biodegradable brown paper bags. Several large trees call our petite yard home. Having large equipment to collect our leaves is excessive, but manually bagging leaves is a bore. This year I decided to try something new. 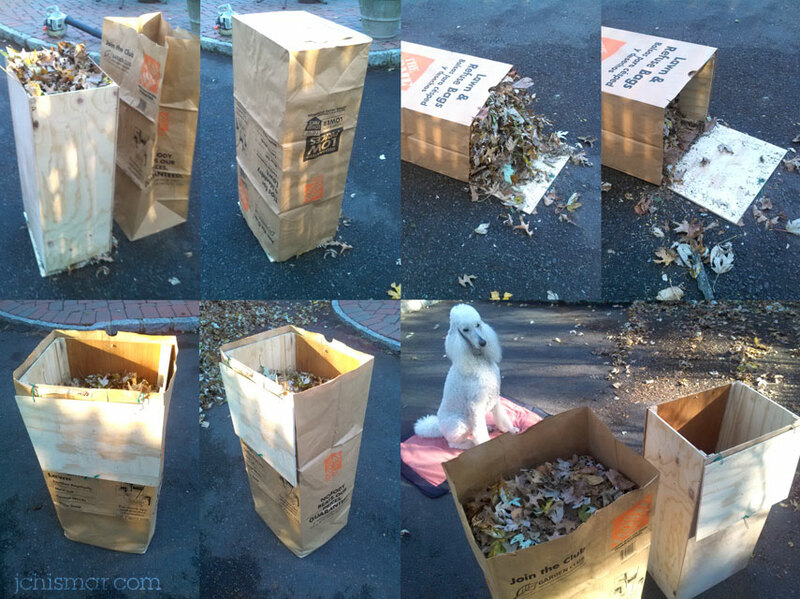 I created a box to shovel the leaves into. Why? Because bags do not stand well on their own and bags always have a way of folding closed just as the shovel is dumping leaves. I easily shovel leaves into the box and compact the leaves more aggressively than if they were in a bag. Once the box is full I cover it with an upside-down bag, tip it on its side and push the leaves toward the bottom of the bag. When I stand the bag upright I pull the box out. This bagging system worked remarkably well. The system can be improved, but I only need to use the thing once a year. I’ll take the box apart and use the plywood on the next project that comes my way. I’ll improve the system next time I build it. Time-Lapse Woodcarving of face (eyes & nose) from John Chismar on Vimeo. The sculpture “sHe” is an exploration into masculine and feminine facial characteristics. My desire to identify gender specific traits increases with my deeper understanding of human anatomy. While examining faces of random people I attempt to isolate features which determine attractiveness and gender. I imagine a face without makeup, facial hair or other superficial trimmings as a mental exercise to study facial topography. The uniform coloration of the wood and the cropping of the nose and eyes playfully disguises the subject. The gender and attractiveness of the model is determined by the perception of the viewer. The interactive quality of this sculpture holds the attention of the observer and invites repeat consideration.